I’ve only just written about the everyday news which quickly becomes history. Then in a short time the history repeats itself. So it’s no great surprise during the last few months in the run up to the autumn budget, that everyone claims they need more money whilst at the same time businesses and tax payers all argue to pay less taxes. It goes without saying that these two things pull in completely opposite directions. Successive Chancellors of the Exchequer end up trying to satisfy everyone and succeed in satisfying no-one. This year an early start was made by the NHS Chief Executive, who claimed that NHS England needed another £4billion on top of the increases they had already been promised. This was never going to happen. 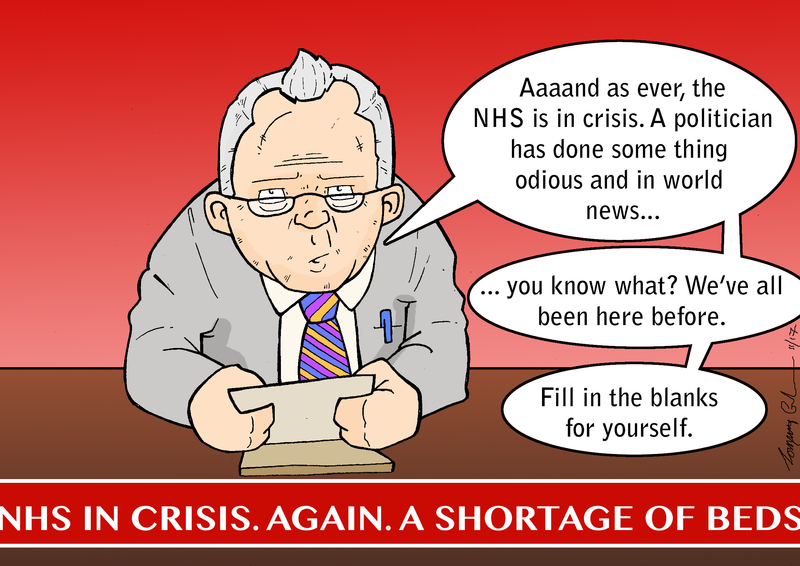 At the same time NHS staff were clammering for pay increases as well as more staff. This too was likely to fall short of their expectations. Interestingly no-one was asking for more beds, except of course the patients themselves who were left on never-ending waiting lists or in corridors in A & E.
Brexit goes round in ever decreasing circles. It’s become an every night series like Eastenders or the Archers but less interesting. Politicians in trouble for their personal behaviour. Either with their hands in the expenses till or somewhere else they shouldn’t be. Hands that is! This will drag on for ages but probably end with no more than a slap on the wrist. Crime used to be in the news a lot but as we are regularly told, it is decreasing significantly. Mainly because the police don’t seem to go looking for burglaries, shoplifters or drug users. Whatever happened to zero tolerance? Technology moves on at a great pace, changing everyday language into incomprehensible gobaldy gook. Bytes are no longer dog bites. Goodness knows what clouds are but they’re not in the sky anymore. There again, perhaps they are? Tablets are trendy things that almost everyone has but they don’t necessarily make you better and you certainly can’t get them from your GP. Shops are closing down as Amazon and eBay become the market of the world. Coins and real money are being replaced by credit cards and imaginary bitcoins. Everyday the news brings forward the same old thing whilst at the same time introducing new unknowns. At the beginning of the twentieth century, who would have guessed the impact that cars would have on society. Aeroplanes were only just getting off the ground and nobody much would have contemplated travelling to the moon. 4 Responses to What’s in the News? Regarding “News still to come”, can we not feel positive about things for once? Brexit – many of us were born during or just after WW2. Surely politicians arguing about territorial issues is far better than actually fighting? Politicians’ behaviour – I’m not condoning it but is this not a case of a few people acting the way they have always done? Crime – Yes there are always crime issues that we would all prefer did not happen but overall we are far safer than we ever were. Technology – Of course this is a massive good news item. Ever since Man invented the wheel, our inginuity has been coming up with ways to make life easier, better or more enjoyable and people have adapted to benefit. Many people say “It was never like this in the old days” but few actually want to go back to those days of no central heating, having to walk everywhere and toil for hours in the fields. Repeating news – Isn’t it great that every day, although we may take a step backwards we also take many more steps forward? It’s a good point you make Alex. There is no question that we are all materially better off now than our forefathers. Nor would I or many others vote to go back to “the good old days”. But and there is still a but —- we seem to be losing some of our respect for each other in the selfish persuit of “ me first , both individually and nationally. The relentless tirade of negative news constantly reinforces this idea. We need a dose of glass half-full optimism as well as some real action on the issues of the day. Then the news won’t need to repeat itself. responding to this blog and its subsequent comments, I just onder how we can a nation, and a world enact and transpose into positive actions, the wishes expressed above. WWII was an occasion when as a european nation, and an advocate for world peace we had to reassess our wartime aliances, and establish a peace in our time in Europe, and the world. Churchill, and Ensienhower, with the post war western european leaders formed then NATO. WE have since seen stability in the western world, and ideals of free trade. Like all growing societies we have differing ideals, and it is difficult with BREXIT to see where it will all lead too, for us as individuals and as a nation. I personally wish for defence stability, with and combined with free trade. There is a trade off, and we cannot survive in europe alone, only as a trading nation: However we must and do depend on a common defence alienance with and as a fellow European nation. There are many views in how we can free trade with our idealogical opposites in this world, and not be intraverted, trading only with our neighbours?It is a conundrum, and remains to be solved, amicably. The USA has recognised Jeruselum as the state capital of Isreal: What ever one thinks, and believes in, in a faith, or historical, and nationalistic terms? One has to come to terms with this line of thought? WE as a political world have established neautral world organisations based and located in Switzerland-interesting- This ideal of a neautral zone within a world of differing political idealogies has been Honoured within Europe during the 19th. and 20th, centuaries. WE as Europeans and the Western world have a recognised base/state in which we can discuss, without fear and with respect world affairs? In this modern world of instant communications, exchange of tweets and bytes of thought, we require a neutal platform, where ideals can be challenged and openly dicussed, not represented by electroic input by people and leaders with the concenus of their indiginous population. The United Nations debating chamber is within the United States of America -New York- This is an assumption by the USA of ‘absolute’ power’ and the internal Politics of the USA, maybe confused, with a neautral point and the ability to influance the world with naked power and aggresion? Where am I going? well dear readers, back to USA and her president and his tweets, bytes, and now enacted policy statement in creating Jeruselum as the state capital of Isreal? I beg to ask the question is America calling for a neutral state in the middle east, with its former name ”Isreal” but its state capital Jeruselum!!! What would I suggest the name of this new nation is??? Heaven?? with no one religious belief, but freedom of all religious beliefs to be practiced there: Where all religious secular heads would be welcome to practice and preach, in faith. Can the world of Judism, christain faiths [rusian, greek, catholic, morman, protestant], allah and mohamidism, buddist, shiek, hinduism the japanise and chines faiths plus many more create such a state? Has President Trump and America been wise, or nieve in his thinking? Can the states of the Middle east make rhymn or reason out of this Ameican statement of fact? The wheel of history is turning, is life or the conception of life a scientific fact -evolution- or a belief of outright faith??? Put another way as a Brit; what Is Brexit? answers on a postcard please to the usual address.